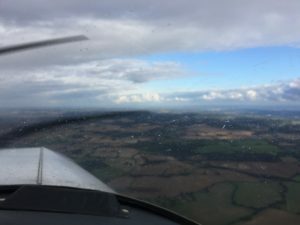 Weather reasonable, a few showers but looks good for solo to Kemble 🙂 First leg out to Swindon and I had to divert south a few miles due to rain showers, my intruction was to fly through them if you can still see the horizon. I couldn’t and could see that it was very clear a few miles south so opted to take that route, if it looked bad then I would turn back. I was having to drop altitude to about 2300, which was still above my limit and I could see there was no cloud lower. While I was concentrating on the weather I forgot to change from Benson to Brize and got a call from Benson to sqwark 7000 and call Benson. I’d planned to do this at one of my checkpoints so I could change frequency on my terms, I didn’t have Brize frequency in yet either! I had it on my plan so easy to program in and call them. Weather was fine south of the M4 and I could soon see Swindon had no rain so could turn north back on track. 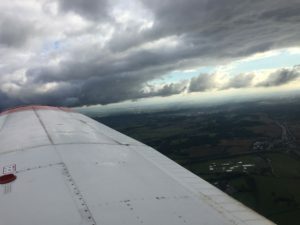 There was no rain I could see further west meaning that I could get to Kemble fine. I forgot to call for PPR abd when I called the tower at Kemble they told me my instructor had phoned to check so all sorted! 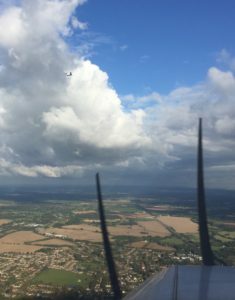 A reasonable cross wind at Kemble, don’t recall what ATC said it was as was concentrating on final … got the aircraft near the runway, kill the power, let the speed bleed off …. hold if off and kick it straight with the rudder ….. aaaannnnndd float!!! Oh well, once I came down I kicked it round straight ok, miles away from centre line but good enough. After a quick cuppa, straight forwards and easy flight back to White Waltham, got all my frequency changes in when I wanted, used the Compton VOR. When rejoining White Waltham (at 11 oclock) I noticed a nice Jumbo fairly close! Looks tiny on my iphone pic! ← Under the Hood and QXC!